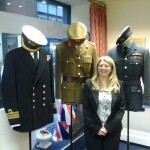 Jackie Packman, Branch Funeral Arranger at Weybridge, has commemorated Remembrance Day with a very smart display of service uniforms from the Army, Navy & RAF. The Army uniform belonged to Major General Sir John Anderson, who served as a junior officer during WW2 in North Africa 8th Army at Tobruck. He later became the head of the Chief Royal Signals and lived until 21st September 2007. The RAF uniform belonged to Wing Commander G.K.N Lloyd who flew a Hurricane during D-Day and was awarded the Air Force Cross by Queen Elizabeth. The Navy uniform belonged to an unknown Commander who served in both World War 2 & Korea in the 1950’s.